Welcome to The Green Sheet subscriptions page. If you want to keep abreast of developments in the dynamic payments sphere, you've come to the right place. As a subscriber to The Green Sheet, you will receive - free of charge - essential information from the only publication devoted to the ISOs and merchant level salespeople (MLSs) that form the backbone of payments. We've been informing and educating the industry's feet on the street since 1983 and continue to evolve in step with the industry as it advances to provide ever more powerful tools for the merchants and other businesses our readers serve. 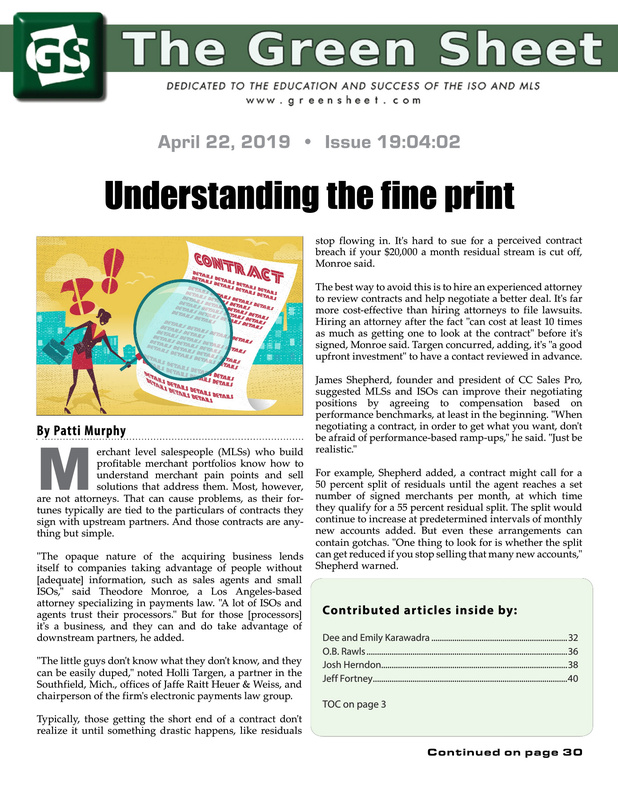 Published twice monthly in print and electronic formats, each issue is chock full of original, up-to-the-minute coverage of critical industry news, issues, trends and developments. Using the links at the left-hand side of this page, you can subscribe to our print or electronic edition - or both. You can also change your contact information or subscription preferences, as well as unsubscribe. Receipt of the e-magazine requires website registration. This quick step entitles you to participate in our popular MLS Forum, which requires a brief enrollment process. If you are looking for the Texas-based classified ad magazine called The Greensheet, visit this link: https://www.thegreensheet.com/houston.